I just read a Cozy Mystery that is based in a beauty shop, and coincidentally received a letter asking for a beauty shop theme. What better time to add to the long list of Cozy Mystery book themes on my site. 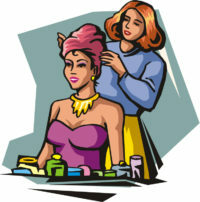 If you can think of any other authors/series of beauty shop Cozy Mystery Series, please post a comment below. Thank you! KG, thanks for these additions! Was there a beauty shop series set in Texas? Seems like I read several but I can’t remember the writer or series name. Jane, hmm, none immediately springs to mind, but that could just be that it’s either new or not by a site author. If anyone can chime in, feel free! Perhaps you were thinking of the series When the Fat Ladies Sing by Linda Kozar. It is about best friends Sue Jan and Lovita who run a beauty shop/boutique in the little West Texas town of Wachita. I bet that’s it. Thanks! I love the Nancy J. Cohen series! Ana, there’s certainly a good reason it’s become a longer running series at this point! There was series of three books by Yasmine Galenorn (Writing as ‘India Ink’) in the early 2000’s. The ‘Bath and Body’ series. ‘Scent to Her Grave’, ‘A Blush With Death’ and ‘Glossed and Found’. This seems to have been her one foray into non-paranormal mysteries. Also, if it counts, “Killer Cuts”, one of the ‘Dead-End Job’ mysteries by Elaine Viets is set in a hair salon. The last book in Lila Dare’s Southern Beauty Shop Mystery series (Wave Good-Bye) was published in 2013. Any word if she ended the series? PS-I LOVE this website! Lori, unfortunately I haven’t heard anything about a new Lila Dare (or Laura DiSilverio, or Ella Barrick, take your pick of pseudonyms) book for a while. She’s still writing, but it does seem like she’s taking a break from the Southern Beauty Shop Mystery Series.